The CardLinx Association – The Leading Association for the Card Linked Offers and Loyalty Industry. CardLinx Association members collaborate to establish industry standards for mobile payments, in-store offers, card-linking and many other technologies that comprise the Internet of Commerce Things (IoCT). CardLinx members serve or represent over 6 million merchants, have issued over 1.9 billion payment cards, and serve consumers with over 200 million card-enabled accounts and over 700 million active daily users. Alliance Data’s Epsillon Business has agreed to be sold for over $4 billion to Publicis. Alliance Data Systems Corporation is a publicly traded provider of loyalty and marketing services, such as private label credit cards, coalition loyalty programs, and direct marketing, derived from the capture and analysis of transaction-rich data. Apple unveiled its much-anticipated credit card that fully integrates with Apple Pay. The Apple Card offers cash back on purchases, 1% with the physical card—made from titanium with no visible numbers—and 2% with the mobile app. Instagram, Facebook’s photo sharing platform, is enabling consumers to tap and buy products right from the app. Checkout, the new shopping feature, circumvents traditional merchants and allows manufacturers of popular brands to sell direct through the Instagram feed without the user even having to leave the Instagram. FIS has entered into an agreement to acquire e-commerce payments processor WorldPay. FIS's acquisition of WorldPay illustrates that the drive for scale is an important component for innovation and growth in the fintech industry. The CardLinx West Forum on Tuesday, March 12th in San Francisco highlighted the role of the consumer as the keynote presentations explored different facets of the forum theme: Beyond the Shopping Cart, Online-to-Offline Commerce. Mastercard is expanding its range of worldwide payment options with an agreement to acquire Transfast, a global cross-border account-to-account money transfer network. The combination of Transfast and Mastercard will create solutions for businesses that experience higher costs, compliance requirements, and limited predictability for cross-border payments. Target+ is an example of the accelerating trend for merchants to expand their digital advertising capabilities. Facebook, Google and Microsoft are the leading digital advertising platforms for commerce but retailers including Amazon, Walmart and now Target have realized that they must become a first stop for consumers on their shopping journey or risk becoming irrelevant. The CardLinx Association today announced its 2019 board of directors including Microsoft, Rakuten, Sumitomo Mitsui Card Company, Mastercard, Discover, First Data, FIS, Transunion, Augeo, Affinity Solutions, Fidel, and Empyr. This E-Linx issue highlights industry news about Target and Walmart's move towards becoming digital advertising platforms, Apple and Goldmans' new joint credit card, Alipay at Walgreens and the BB&T/SunTrust merger. Walmart moves to integrate their digital advertising in-house, betting that by leveraging their first-party shopping data from online and offline purchases they will increase revenues and challenge online-native retailers for market share. The CardLinx Association will be presenting the first annual CardLinx O2O Awards recognizing outstanding achievement in the online-to-offline (O2O) industry. Help us select the vanguard of this dynamic ecosystem by casting your vote! Japan Foodie is launching TakeMe Pay, a smartphone multi-payment gateway that manages Chinese payments (Alipay, WeChat Pay, CUP, etc. ), international payments (Visa, Mastercard, Apple Pay, etc. ), and Japanese payments (LINE Pay, et al). The goal of TakeMe Pay is to combine the biggest payment services in the world into one app and become the ultimate smartphone multi-payment gateway. Alipay is now accepted at all Walgreens in the United States, becoming the largest drugstore chain to provide Alipay as a form of payment. This offering builds on last year’s partnership announcement between Walgreens Boots Alliance and Alibaba Group, an affiliate of Ant Financial Services Group. Last week’s mega bank merger between BB&T and SunTrust creates the 6th largest commercial bank in the US. This yet-to-be-named new bank is a bet that increased scale will help keep up with larger competitors in the drive for the latest technology. EFT Solutions is the leading electronic funds transfer at point-of-sale (“EFT-POS”) solution provider in Hong Kong with more than 50% market share. EFT Solutions also creates value-added software like customized software for customer relationship management and electronic retail management for acquirers and merchants. This E-Linx issue highlights industry news about calls for the break up of Facebook, Fiserv's acquisition of First Data, Google's EU fine, Visa and Mastercard's denied entry into China, and Honda's in-car payment system. What’s Next For Commerce In 2019? CardLinx CEO Silvio Tavares identifies top e-commerce trends for 2019. According to a report by Bloomberg News, Walmart has recently withdrawn from Google’s Shopping Actions, an e-commerce service, as well as Google Express, a delivery service. Google was fined $57 million by the French data protection authority, known as CNIL, for violating the EU consumer data privacy regulation known as General Data Protection Regulation (GDPR) that was passed in May 2018. Sentral addresses unfulfilled needs in the growing card-linked services business by building a new platform that provides access to transactions processed by US debit networks. CardLinx announces new CardLinx services for 2019 for our members. Today, Fiserv announced the acquisition of CardLinx founding member First Data in an all stock deal worth $22 billion. The proposed deal is one of the largest acquisitions in the financial technology sector. LINXO Group helps consumers better manage their money in order to better achieve their projects and have more success in their lives. US-based Visa and Mastercard face additional headwinds in entering the Chinese market. According to FT, China's central bank known as the People’s Bank of China declined to acknowledge Visa and Mastercard’s applications to process renminbi payments. Honda is the latest carmaker to launch an in-car platform at CES. This year Honda offered demos of Honda Dream Drive in the all-new 2019 Honda Passport at CES from January 8-11, 2019. Meniga's new multi-bank rewards program aims to rival Google and Facebook and become the leading digital advertising platform in Europe. Koopid was born from a simple premise - that the relationship between a business and a customer should be modeled as a transparent and persistent conversation. This E-Linx issue highlights industry news about Amazon Go's potential expansion into offices, hospitals and airports, Brexit's effect on GDPR and the new initiative between CardLinx members FIS and Excentus. This E-Linx issue highlights industry news about Chase's new CLO program Chase Offers, Amazon's US in-store digital payment system, Standard Cognition's $40 million fundraising round for their cashierless technology and Alipay's global in-store partnerships. RBC Ventures was created in 2016 by Royal Bank of Canada, Canada’s largest diversified financial institution, to support innovation and the development of transformational technologies through the direct investment in startup, early and growth-stage companies as well as indirectly through limited partnership fund investments. This E-Linx issue highlights industry news about Yahoo Japan's latest partnership, the data industrial complex, Verrency's growth and Cardlytics expanding into Asia. The CardLinx West Forum on Tuesday, October 15th in Seattle demonstrated in the expansion of the card-linking ecosystem across a variety of industries. This E-Linx issue highlights industry news from Amazon Pay's moves in Japan, CardLinx member Collinson Group's investment in Grab and UnionPay's expansion in Europe. CardLinx's first CardLinx Asia Forum in Shanghai on September 5th started with energy and excitement as the first CardLinx event in China. Paylead is a platform that allows financial institutions to provide merchant funded offers to their online customers. Dosh is the fastest growing online-to-offline engagement platform that drives in-store sales through contextually relevant card-linked offers. This E-Linx issue highlights member news from Dentsu, CO-OP FS and Cardlytics as well as an industry study on personalized digital marketing preferences. Current is a blockchain-enabled media network that rewards users for streaming media. Over one million consumers have earned credits for playing their favorite music and videos. JetPrivilege is an independent, loyalty and rewards program formed in 2014 by Jet Airways and Etihad Airways. JetPrivilege members earn JPMiles through flights, dining and shopping which can be redeemed at their rewards store or flights with Jet Airways and over 20 partner airlines. The CardLinx Association today announced that their industry-defining event The CardLinx Asia Forum will be held in China for the first time on September 5th at the Grand Hyatt Shanghai. This executive-level event will focus on artificial intelligence and commerce in the development of payments, retail tech and travel tech in Asia. This E-Linx issue highlights the latest news in the O2O ecosystem from Ant Financial's latest moves, to FIS's survey on bank readiness and Empyr's growth. With more than 70 million downloads, GasBuddy’s smartphone app is the leader in crowdsourced information to help drivers find the best gas prices, closest stations, friendliest service, cleanest restrooms, and tastiest coffee. Auto Finance News announced today that it has partnered with CardLinx to co-present two groundbreaking events in Shanghai. Auto Finance Summit Asia and the CardLinx Asia Forum will bring together key executives and decision makers from Asia and around the world. 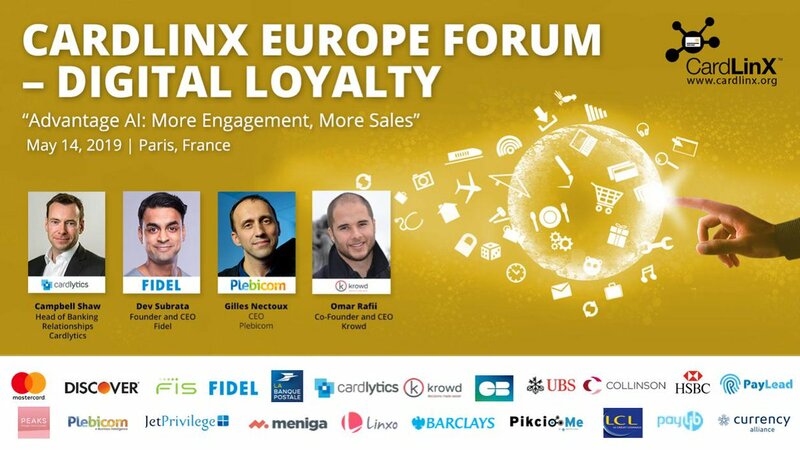 This E-Linx issue highlights the latest O2O survey, TransUnion's acquisition of iovation, CardLinx's webinar on GDPR, CardLinx CEO's Forbes article. and Spent App's newest feature, Spent Pay. The CardLinx Association today released new data from the 2018 Card-Linking and O2O Industry Annual Survey and announced new groundbreaking artificial intelligence (AI) commerce forums in the USA, China and Japan. This E-Linx issue highlights the latest industry news from CardLinx members Groupon, Recruit, and Yahoo Japan, as well as Walmart's latest moves in India. Launched in 2011 in Shanghai, 55Haitao is now the largest shopping guide for Chinese cross-border shoppers. It provides an online community with hot deals and cash back for Chinese shoppers. handy, the flagship product from Tink Labs Limited, is a revolutionary hospitality IoT solution designed to uplift ancillary revenue, guest satisfaction and drive better cost efficiencies for hoteliers. For travelers, handy is the world's first amenity that combines an in-room guest services platform to interact with hotels and enable hassle-free travel experiences. Verrency provides world-leading, enterprise payments services for card issuers, merchant issuers, processors, and other digital financial services institutions. Based in Paris, Plebicom is a leader in Europe of card-linked offers, loyalty platforms, offer sourcing and audience monetization with 2.4 million active online shoppers and 1.500 merchants across Europe. The CardLinx West Forum in San Diego on April 10th focused on artificial intelligence, big data, cloud computing in the future of retail. The high energy forum provided powerful online-to-offline insights and extensive networking. Payce harnesses the value that card-linking and online-to-offline commerce offers to help members reach their personal financial goals, not just to accumulate points or rewards. We provide a bespoke platform to partners across many verticals that allows members to earn hard-dollar rewards at thousands of merchants online, in-stores, and at restaurants. CardLinx recently spoke with Cary Chessick, CEO of Butterfly Saves. Butterfly is an extension of the Google Chrome Browser that provides the Butterfly technology platform, which allows consumers to earn cash back online and in-stores. The CardLinx Board of Directors approved the Black Bear Standard that provides functional requirements for debit payment networks implementing card-linked services. CardLinx member Shop Your Way is expanding their network and benefits through a strategic partnership with GasBuddy, whose Pay with GasBuddy gasoline payment service entitles hundreds of thousands of its users to a discount on every gallon of gas they pump. CardLinx announces a new networking opportunity for CardLinx members: the CardLinx Startup Roundtable. The roundtable provides opportunities for startups and early growth, small cap companies in the association to exchange ideas and connect. Join by emailing info [at] cardlinx.org today! MyGini is an integrated payments and shopping app that delivers the ultimate "win-win-win" for cardholders, retailers and financial institutions. This E-Linx issue covers Alibaba's high tech plans for future Olympics, Rakuten's partnership with Walmart for grocery delivery in Japan and startup Flux is bringing digital loyalty and SKU-Level offers to the UK. Butterfly is a Google Chrome Browser Extension that allows consumers to automatically apply coupons and earn cash back at over 2,800 online stores. Butterfly also delivers cash back via card linked offers at over 2,500 restaurants and retailers when consumers dine and shop in-store. Total Wine is the largest independent retailer of fine wines in the United States. Its customers enjoy a selection of more than 8,000 different wines, 2,500 beers and 3,000 spirits at tremendous savings, thanks to Total Wine's buying power and longtime relationships with producers, importers and wholesalers. This E-Linx issue covers fintech innovation in Asia, where the next CardLinx Forum will be held in Tokyo. Also includes articles on Cardlytics's IPO and Visa's new digital wallet card. You World is an in-store offer aggregator that plugs into major cross-border platforms such as WeChat and Alipay, and a network of travel apps such as CTrip. Cardlytics uses purchase-based intelligence to make marketing more relevant and measurable. They partner with more than 2,000 financial institutions to run their banking rewards programs that promote customer loyalty and deepen banking relationships. Fidel is an API platform that makes it easy for developers to link payment cards to loyalty and marketing services. Fidel provides open-source mobile native and web SDKs, high quality open-source documentation and instant developer support. Additionally, the RESTful API allows developers to create card-linked applications that receives real-time payment transaction data through webhooks. 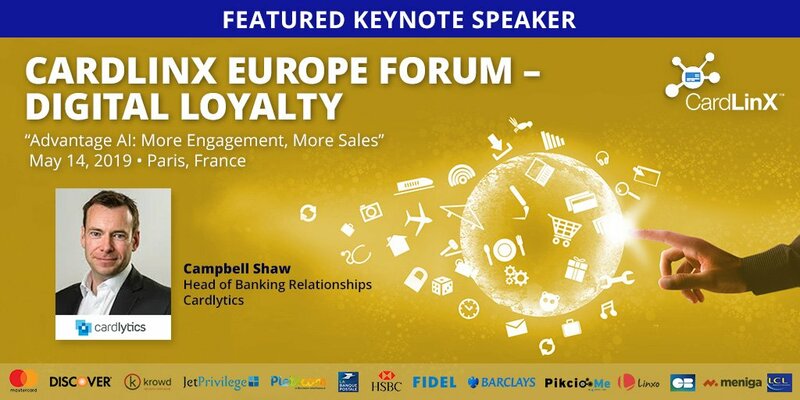 CardLinx announces 2018 forums in Tokyo, London and San Diego and new members TransUnion, Klarna, Groupon and JCB. Founded in 2005 in Stockholm, Sweden, Klarna is now one of Europe's largest banks and is providing payment solutions for 60 million consumers across 70,000 merchants in 18 countries. OpenSparkz is a start-up that operates in the card-linked space. Located in Sydney, OpenSparkz works with organizations wishing to provide merchant funded offers to their customers, and then engages directly with the merchant community to develop bespoke card-linked offer solutions. First Data is supporting the further expansion of Apple Pay by enabling merchants to offer loyalty, gift, and stored value card solutions through integration with Gift Solutions and the Clover platform. FIS is a leading global provider of technology and services to the financial services industry. Over the past decade it has acquired leading payment companies including e-funds, NYCE and Metavante. Based in London, Fidel is an API platform that makes it easy for developers to link payment cards to loyalty and marketing services. Tuango, one of Canada's largest daily deal websites, talks about their approach and upcoming O2O projects. Rewards Network, a provider of marketing, loyalty services, dining rewards programs and financing to the restaurant industry, was acquired in its entirety by TowerBrook Capital Partners L.P., the New York and London-based investment management firm. Headquartered in San Francisco, Euclid Analytics applies today's data science principles and shopping behavior logic to data from Wi-Fi and smartphones to derive actionable insights for retailers, grocers and shopping centers. Sift is an intelligent assistant that automatically monitors hidden credit card benefits from extended warranty to extended returns, theft protection, price protection and travel protections and streamlines the claim process to generate automatic refunds for consumers. Gobsmack Rewards joins the CardLinx Association! Headquartered in England, Gobsmack is a proprietary cash rewards platform that aggregates offers from multiple channels and includes over 5,000 brands including Avis, Sainsbury's and Boots. CardLinx Certification is here! A new benefit for CardLinx members to drive new business and enhance branding. CardLinx CEO Silvio Tavares was recently featured in a Future in Tech podcast with Richard Jacobs. The topic of the podcast is: Promoting Collaboration and Innovation Among Payment Companies, Advertisers and Merchants. Bank of America Joins CardLinx! Bank of America (NYSE: BAC) joins the CardLinx Association! Bank of America is the second largest US bank with $89.7 billion in annual revenues and 162,000 employees worldwide. A founding member of CardLinx, Bank of America is a leader in card-linking and O2O commerce with its pioneering card-linking program BankAmeriDeals. Groupon, a pioneer in local e-commerce, joins CardLinx. CardLinx's Chicago Forum on Retail in the Age of Artificial Intelligence and Commerce Bots drew an engaged and dynamic crowd from the payments, digital commerce and retail industries. CardLInx announces new members including Capital One, JCB, Yahoo! Japan and Dentsu and the launch of a new groundbreaking forum on Retail in the Age of Artificial Intelligence (AI) on September 12, 2017 in Chicago. The Hummingbird Standard provides consistent reporting metrics to allow marketers, merchants, and issuers to measure the success of card-linked programs with a common industry language. The standard also provides an advanced analytical framework, including incremental and long-term customer value measurements, to assist advertisers in measuring and assessing program efficiency. Recasher provides a multi-merchant loyalty solution with real-money cash back reward functionality. Dentsu is the world's largest advertising agency brand. Led by Dentsu Inc. (Tokyo: 4324), a company with a history of 116 years of innovation, the Dentsu Group provides a comprehensive range of client-centric brand, integrated communications, media and digital services through its ten global network brands-Carat, Dentsu, dentsu X, iProspect, Isobar, mcgarrybowen, Merkle, MKTG, Posterscope and Vizeum-as well as through its specialist/multi-market brands. Survey participants indicated that AI assistants will be the most promising new digital advertising platform. Algorithms for processing voice commands are far beyond the initial roll out phase and AI assistants already help consumers find products, make purchases and track packages. With increased focus and resources, card-linking and O2O delivered through AI assistants are next. With over 100 million card members worldwide and annual transaction volume topping $237 billion, JCB provides merchants with advanced, versatile payment solutions and consumers with an array of credit card services, promotions and JCB group travel services. CardLinx's CLO Debit Work Group convened a meeting on June 20th in San Bruno, California. The productive meeting included a name change from PIN Debit Work Group at the request of the debit networks. CardLinx's Zurich Forum brought together leaders in card-linking and O2O to discuss the latest in European trends in digital and mobile commerce. CO-OP Financial Services brings technical expertise and thought leadership to its membership of over 3,500 credit unions. In this Member Spotlight, CO-OP describes their approach to CLO programs for credits unions. The Boar, CardLinx's first industry standard, provides a tool for digital publishers to assign a specific order ID for a card-linked offer that can be used across multiple digital platforms, including websites and mobile apps. 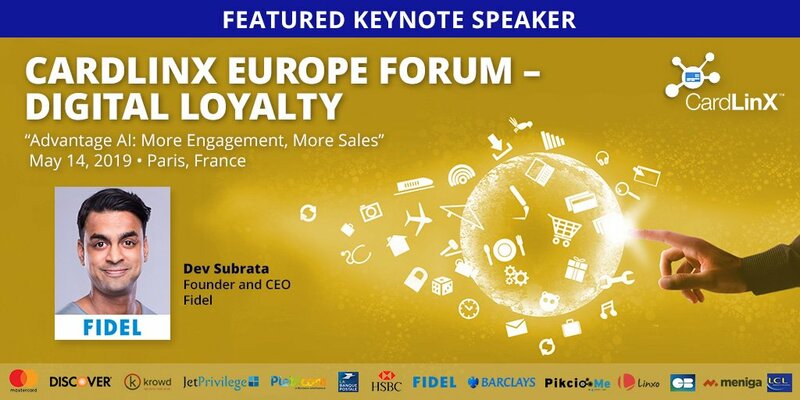 A conversation with LuckyCycle co-Founder Nicolas Coppée on how gamification generates average engagement rates of 75%, reduces abandoned online baskets by 30-35%, adds a fun element at checkout and doesn't impact pricing despite providing a potential cash back offer. Investment in O2O continues with CardLinx member Meniga receiving additional funding. Yahoo! Japan's investment in VR/AR reaffirms the result of the latest CardLinx survey: Artificial intelligence is the next big digital advertising platform. Yahoo! Japan (TYO: 4689) is the newest member of the CardLinx Association. Founded by Yahoo! and SoftBank, Yahoo! Japan is the most visited website in Japan, the world's third largest economy. Toppan Printing is one of the largest manufacturers of payment cards, smart cards, product coupons and gift certificates in Japan, Toppan has net sales of $13.1 billion and over 46,700 employees. The recent 2017 Card-Linking & O2O Industry Survey shows that there is a way to bring consumers back to the shopping center: card-linking and card-linked loyalty programs. The CardLinx board of directors authorized a work group to develop standards, common APIs and promote industry collaboration to facilitate card-linking on PIN debit networks in the United States. CardLinx member Empyr launched CPR™, a cost-per-revenue marketing platform that redefines online-to-offline (O2O) performance marketing. With 100% attribution of in-store sales generated from online ads, CPR takes the guesswork out of calculating advertising ROI. Sumitomo Mitsui Card Company responds to some questions about its card-linking programs. Sumitomo Mitsui Card Company, a leader in card-linking innovations, describes its latest projects and initiatives in this fast growing sector in Japan. Caruso owns and operates The Grove in Los Angeles which is ranked #2 in Fortune’s ranking of the highest sales volume shopping centers in North America. Founded in 1987, Caruso is one of the largest, privately held real estate companies in the United States, providing real estate development services and a portfolio of landmark retail and mixed-use properties in Southern California and other parts of the United States. Veterans Advantage is a mission driven and chartered public benefit corporation. The company was created to empower veterans and U.S. military communities by partnering with leaders in the travel, financial services and retail industries. Veterans Advantage enables exclusive veteran and active duty member discounts. VetRewards is a benefit platform that allows Fortune 500 companies to bring real value, engage grassroots communities and provide a frictionless commerce experience to military communities. The hometown CardLinx Forum in San Francisco "Mobile Commerce and the Internet of Commerce Things" wrapped up on April 26th at the Pullman San Francisco Bay Hotel. Enroll & Pay is the newest CardLinx member! Enroll and Pay is a card-linked loyalty application that is seamlessly integrated with the POS terminal at brick and mortar merchant locations. A customer easily enrolls into the card-linking program through their initial credit card payment with a merchant. We welcome Soli to the CardLinx Association! Soli is a new loyalty app that saves the planet while you shop. Their mission is to leverage consumer spending to reduce carbon dioxide emissions, fight climate change and support a sustainable business community. Every dollar spent using a payment card linked to Soli reduces two pounds of carbon dioxide emissions. With over $1.4 billion in annual sales and 2,846 employees, Recruit Lifestyle offers 30 services making in-store and online shopping made more rewarding. Recruit Lifestyle’s services help streamline businesses in providing consumers with something special every day in dining, beauty, travel and health services. CardLinx CEO Silvio Tavares was recently profiled in Bank Innovation for their article: Will Merchants Hand Over More Data to Make Mobile Wallets Work? by Philip Ryan. With the fortunes of brick-and-mortar merchants declining and online retailers ascending, Silvio makes the case that this is the opportune time for brick-and-mortar merchants to share SKU-level data with FIs and payment networks in exchange for deploying personalized, targeted marketing campaigns. Ebizu is the newest member of The CardLinx Association. Headquartered in Singapore, Ebizu tracks over 200 million consumer profiles to deliver better ads to the right consumer at the right time. The company helps advertisers, brands and publishers reach and engage the connected consumer in a mobile first world using behavioral information and mobile technologies. TheStreet.com recently captured the essence of card-linking with the headline: Just Like Magic: Card-Linking Takes the Work Out of Store Rewards Programs. CardLinx CEO Silvio Tavares was extensively quoted in the article. Gamification has gone mainstream in payments. From Starbucks to CardLinx member Luckycycle, gamification for mobile payments is evolving to increase consumer engagement and increase overall sales. On February 8th, 2017, The CardLinx Association board of directors voted unanimously to adopt the Cobra Standard Protocol Priority for Over Redemption v 2.0. The CardLinx Forum "Reinventing Retail: Mobile and Multi-Channel Commerce" was held yesterday on March 7th at the Adolphus Hotel in Dallas. The engaged audience asked questions that sparked insights and feedback that raised the overall knowledge base in this fast growing sector. The unique event structure and presentations allowed plenty of opportunities for reconnecting with business associates and networking with industry leaders and peers across industries. Gini is the first CardLinx member based in Hong Kong. The company focuses on online-to-offline digital commerce technology that enables merchants and marketers in Asia to target loyalty and rewards based on actual transaction data. Boosterville joins the CardLinx Association! Boosterville boosts sales for local businesses and non-profits by seamlessly connecting merchants with cause-driven buyers. Luckycycle is a world leading innovator in gamifying the checkout experience both in-store and on-line. The company has over 50 clients including Carrefour (Europe's largest retailer), Samsonite and Keihl's. These customers operate in five countries using the Luckycycle algorithm to add an element of fun to shopping. Automakers are expanding their business models to encompass electronic payments and internet-connected vehicles. Both Volkswagen and Daimler AG recently announced acquisitions of payments companies. The CardLinx Asia Mobile Commerce and Card-Linking Forum was held on February 7, 2017 at the ANA InterContinental Tokyo. Industry leaders discussed card-linking, loyalty and online-to-offline marketing strategies as the distinction between in-store commerce and e-commerce is blurring. Capital One (NYSE: COF) joins the CardLinx Association. Founded in 1995, Capital One is a diversified financial holding company offering a broad spectrum of financial products and services to consumers, small businesses and commercial clients. We welcome Orient Corporation (TSE: Code 8585) to the CardLinx Association! Orient Corporation is one of the largest consumer credit companies in Japan and offers an array of financial products including credit cards, direct cash loans, installment credit services and bank loan guarantee services. CardLinx member Augeo is acquiring another CardLinx member Edo Interactive. Augeo is a leader in consumer and employee engagement through card-linking, loyalty and other engagement offerings with over 850 clients in 55 countries. Rewards Network joins The CardLinx Association. Based in Chicago, Rewards Network includes over 11,000 restaurants and has provided over $2.5 billion in total cash financed to restaurants, bars, and clubs in their network. Will Fintech Perish or Prosper Under President Trump? Silvio Tavares, CardLinx CEO, writes about the impact of a Trump presidency for the fintech industry. CardLinx announces the availability of a new open source card-linking software suite developed by Microsoft, one of its founding members. Microsoft has made the codebase for its Earn card-linking platform free and publicly available under the MIT License so that other companies can build on the code and expand the availability of card-linking. Yelp launches a Cash Back rewards program through a partnership with CardLinx member Empyr and its online-to-offline card-linked offers platform. Consumers will receive up to 10% cash back on purchases at participating businesses in the US. The program is active with primarily bars and restaurants and will be rolled out to more stores over the following year. CardLinx member Rewards21 introduces a card-linked offer (CLO) technology platform for a rewards program that provides cash back for dining. Consumers join the program by registering their payment card with Rewards21 and then simply using their card to receive cash back at participating restaurants, removing the hassles of coupons. Erno Tauriainen, founder of SPENT app discusses how SPENT is incorporating the latest in fintech mobile technology. Japan Foodie is a leading digital restaurant guide smartphone app with reservation and mobile payment functions for users. By linking credit cards to the app, consumers can pre-pay for a reservation or pay at the restaurant using a QR code within the app. We welcome Mitsubishi UFJ NICOS Ltd. (“MUN”) to the CardLinx Association. MUN is Japan's largest issuer of credit cards. The company is an affiliate of Mitsubishi UFJ Group (“MUFG”), Japan’s largest financial service group and the world's second largest bank holding company with $2.46 trillion in assets. CardLinx members First Data and Verifone partner with Alipay to bring card-linked offers to Chinese consumers traveling overseas. CardLinx member Meniga expands to the US with an office in Boston. A Reykjavík-based company Meniga provides white label financial products and services for banks and advertisers by using data to provide better mobile and online banking experiences for customers and card-linked marketing for additional revenue. With over 40 million customers in 18 countries, Meniga is a pioneer in comprehensive personal finance management. We welcome T Point as the newest member of The CardLinx Association. Over 48 million members use the T Card, a membership card that can also work as a credit card to earn and spend T Points online and at over 67,000 T Point alliance partner stores throughout Japan. We welcome DNP (Dai Nippon Printing) to the CardLinx Association. Established in 1876 to spread knowledge by printing newspapers, DNP focuses on technologies for expressing and processing information including payment and smart cards, publishing, packaging and lifestyle materials, and industrial electronic components and devices. Hilton Worldwide has enhanced its HHonours loyalty program with a digital key for its top rated mobile app. Now with digital key, consumers can make reservations check in and open their room with their mobile app at over 13 brands and 4,700 properties in 104 countries. On October 14th, 2017, The CardLinx Association board of directors voted unanimously to adopt the Honey Bee Model Consumer Consent for Card-Linking v1.0. The Honey Bee Model Consumer Consent is a useful guideline that adheres to industry best practices for consumer disclosure and consent to opt-in to a card-linking program. MasterCard's MasterPass is included in OnStar GO, a new car-based operating system for General Motors that is being developed by IBM Watson. According to the report, over 2 million 2017 model year GM vehicles will be equipped with OnStar GO to let consumers pay for gas and preorder and pay for coffee from their dashboard. Shinhan Card, the largest card issuer in Korea introduces a new card-linked program with Kakao Corp., Korea’s largest messaging and social media platform. The CardLinx Internet of Commerce Things Forum convened leaders throughout the card-linking ecosystem to discuss new advances in technology that enables every internet-connected device to make purchases using card-linking. Over 130 members and attendees came to San Francisco to collaborate, learn and strategize on the future of digital commerce, online-to-offline marketing and brand and consumer engagement. Facebook rolls out Marketplace in its mobile app, adding social commerce to the app's Swiss army like capabilities. Through Marketplace, Facebook users can find and sell items nearby with the seller clearly visible, a departure from other platforms like Craigslist or eBay. Q&A with Ken Hirschman of Ebates discussing why they are adding in-store offers to their e-commerce cash back program and the benefits for merchants. Ken also discusses the opportunities for card-linking to become an essential and dominant component for every omni-channel marketing strategy and plan. Mastercard introduces Identity Check Mobile in Europe to simplify online shopping for millions. Identity Check Mobile uses biometrics, such as a fingerprint or facial recognition through a selfie, to verify a cardholder’s identity for payment. Microsoft created the AI and Research Group, a 5,000 person group to be led by Microsoft Researcher EVP Harry Shum. Formed with teams from the Information Platform, Cortana and Bing, and Ambient Computing and Robotics teams, the AI and Research Group will work to integrate artificial intelligence (AI) into everything Microsoft does from applications to infrastructure to the cloud. To celebrate its first anniversary, Samsung Pay taps another CardLinx member Coupons.com to bring card-linked offers to the Samsung Pay app. CardLinx is presenting a panel on "Card-Linking: The Ultimate Tool for Your Loyalty Program" at the Merchant Advisory Group's Annual Conference on Tuesday, September 27, 2016. 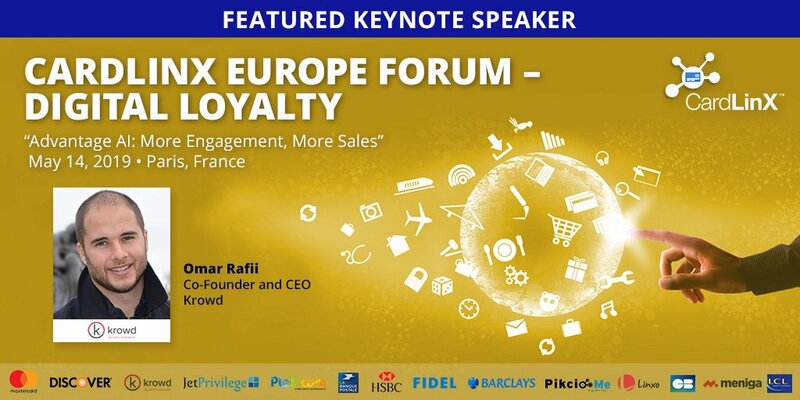 CardLinx CEO Silvio Tavares will moderate with CardLinx members MasterCard, Shop Your Way and Quotient as panelists. PayForward joins the CardLinx Association. Founded in 2013, PayForward is a financial technology company providing members with a way to earn instant cash by shopping at participating merchant partners through a linked payment card. Jeff Mankoff, founder and CEO of vPromos, discusses two ways that card-linked offers can be delivered, linked and redeemed: cloud card-linking and the second is terminal integrated card-linking. Each has very different ramifications for the retailer and customer; cloud card-linking is easy to implement and get started, while terminal integrated delivers a better merchant and customer experience. The card-linking industry has expanded into the affluent travel industry. Along with today's news that the Collinson Group has joined the CardLinx Association, CardLinx member MasterCard announced new travel benefits for affluent travelers. Silvio's banking.com article "Transforming Banking Through the Internet of Commerce Things" discusses how card-linking is changing the future of banking. UBS joins the CardLinx Association. The launch of iOS 1o for Apple iPhones includes two IoCT updates: Apple Pay enabled on mobile Safari and Siri can now help you order things. Is another dotcom bust in our future? Will the year end in a dotcom bust? Not, so says CardLinx CEO Silvio Tavares in today's Benzinga's article. Here's the full article about the Internet of Commerce Things by CardLinx CEO Silvio Tavares. Welcome to CardLinx’s Internet of Commerce Things Blog! We’ve launched this blog as a place to discuss the latest technologies and innovations across all the industries the CardLinx Association covers: marketing and advertising, payments, banking, card-linking, loyalty and offers, consumer retail and e-commerce. We will also spotlight new and evolving technologies influencing these industries like biometrics, cloud computing, big data and deep learning applications. The CardLinx Association is traveling the globe and bringing together leaders in Online-to-Offline, Artificial Intelligence, Payments, and Retail. The education and networking that happens at our events are shaping the future of the industry …and the world. CardLinx members enjoy exclusive access to card-linking industry research, best practices and thought leadership content in both presentation and video formats. CardLinx’s 2018 Card-Linking & O2O Industry Survey is now available. Learn what card-linking is, why it’s important to you, and how it’s changing the payments industry. Want to learn more about what we do and how you can be a part of The CardLinx Association?